The album begins with Teddy P, Matt Marshak's personal homage to the late Teddy Pendergrass. Pendergrass first rose to fame as lead singer of Harold Melvin & the Blue Notes in the 1970s before a successful solo career at the end of the decade. Matt's heartfelt tribute is full of interesting guitar gimmicks, a mirror of his vivid live show. On the sultry Tell Me How You Feel Matt's guitar compete with Gina Breedlove's gorgeous vocals. The sensitive Silent Knowing features Barry Danielian on muted trumpet. Matt's silky smooth guitar caresses the moment. For So Long is another fantastic example how Matt approaches the music with new technology and creativity. With Peace By Peace he combines elements of traditional guitar sound and Urban music. The Harlem River Drive is a north–south parkway in the New York City borough of Manhattan. Marshak delivers his personal impression of this well frequented street. Cackalacky Cool is Matt's tribute to the famously original sweet potato spiced condiment! Time For Takeoff is an adaption of Peter White's style, but Matt always adds his individual note. Short and brilliant Benjie Porecki's piano interlude. Glen Burnie offers a horn arrangement in the fashion of Tower of Power, while Matt extensively uses his wah wah effects. Backyard Party continues this foot pedal expression. Jimi Hendrix was one of the early users who popularized this effect. Matt is obviously addicted to this funky sound. Final song on this album is Dancing With My Daughter, a slow reflective tune keeping memories of special moments. Mario Cruz appends emotional sax lines. The arrangement in the Blood, Sweat and Tears way is no coincidence. 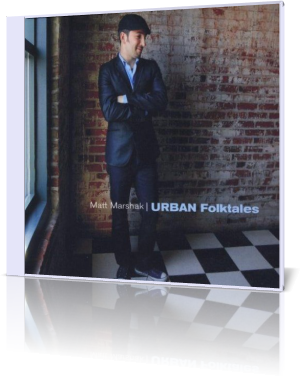 Urban Folktales is a consistent follow-up to Matt Marshak's previous projects with a big dose of wah-wah guitar.